Some time ago the film Paddington Bear 2 came out. If, like me you are fan of Paddington, you will know the story and the character of Paddington Bear. Michael Bond was the author of the Paddington Bear stories, apart from Paddington 2 as he died last year. I was very fortunate to have gone to his Memorial service at St Paul’s Cathedral. 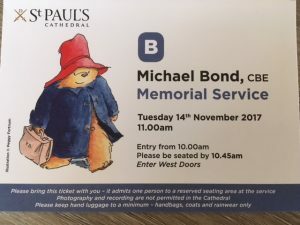 It was amazing and many famous people spoke of Michael Bond and also of his most loved character, Paddington. The Church Times has a good review. Being cast adrift requires a human response- the disciples had certainly been cast adrift and they were displaying a human response. After the crucifixion they had fled and then gone in hiding in an upper room in Jerusalem, Peter had denied Jesus, Judas had betrayed him. All of these are human responses to a situation where the world had been turned on its head and any wisdom with it. Nothing they had, was enough to prepare them for the crucifixion and the death of Jesus, lord and master, teacher, healer, preacher, sent to save them. How was he going to do that now? In the gospel we have the story of Thomas, the disciple. The Rev’d Bill Hurdman used to preach inthe Minster about Thomas, he used to talk about honest doubt, doubting, don’t we all do it from time to time, in the midst of all the problems we face which one of us hasn’t had some doubt. It’s not really a weakness, and it brings it home to us that even the disciples who were with Jesus all the time, there was a sense of doubt about the resurrection and all that Jesus had promised. Believe in the impossible, see the invisible, have faith, one giant step….. The story before the passage about Thomas shows that the disciples were meeting in an upstairs room, locked for fear of the Jews. Then suddenly Jesus, without a sound stood amongst them and greets them in the usual way, “Peace be with you.” And he showed them his wounds. The disciples were so pleased, they rejoiced, bit of an understatement I think! Jesus their hero, now proven as the Son of God returns, you bet they rejoiced. In other words, now is the time that you need to be getting on with the mission ahead of you ….or get out of this locked room and spread the word. I sometimes feel like this, just go on and get on with it!! Two more important things happened at this meeting, Jesus then breathed on them the Holy Spirit,. This was so that the disciples and then later all Christians can forgive others sins, priests are seen as being the ones who can do this but in fact as Christians we can all do this for each other. It is one of the most powerful messages and that forgiveness means that we can go out and leave all the things behind that we are not happy with. This is why Jesus died for us. But Thomas… he wasn’t there was he; I wonder why he hadn’t made it? He in all accounts was a very pragmatic person; John paints a picture of a gloomy, intensely practical, no nonsense disciple. But Jesus returned and came to Thomas especially so that he should believe. Jesus was a very different refugee and we know that He came to earth in human form and took on this humanity but He was also divine and this made him a very different to the disciples and to all of us. Being human means for us all, that there are things that we can’t do or find difficult, not just being accident prone, like Paddington who tried many things and had many, many accidents. We can’t always understand why things happen in the world the way they do. Thomas was simply showing that he could not believe until he had seen, after all the other disciples had seen. For us, we have this to remind us that we have to believe even though we can not see directly, we believe, we have faith and we know that Jesus died for us to free us from our sins and to give us eternal life. But yet that is still invisible and to a non believer impossible. We do have signs all around us, we have the sign of the cross, the forgiveness of sins, the bread and the wine, the body and the blood, the Holy Spirit in all its ways of finding us and keeping us safe. Jesus left the disciples with all they needed to go out into the world and spread the message. The disciples were tasked with going out into the world, showing the love and wisdom of God. The wisdom of the world can indeed be turned upside down, in the story of Paddington many things were often turned upside down, but the story goes on. Paddington and the Brown family go out into the world to make things right, with conviction and a kind of wisdom, but above all, a love and sense of doing what is right. I’m not certain that we would all follow without some sense of honest doubt but we do know that Jesus has given us all that we need to go out and to live and serve the Lord. What an amazing week! Quite a story, starting with the triumphal ride into Jerusalem on Palm Sunday on the humble donkey. Crowded streets, the place packed with people preparing for the feast of the Passover, Jesus turning over the tables in the temple, the Last Supper in the upstairs room, for fear of being found, the long night in the Garden of Gethsemane, the betrayal of Jesus by Judas, the capture by the soldiers, Jesus coming before Pontius Pilate, the crowds calling for him to be crucified and the release of Barabbas. Followed by Saturday, the holy day for the Jews. And so to today, the good news that Jesus is risen. Jesus conquers death and is alive for us all. But let’s go back to the events of the last three days, back to that tomb, the tomb given by Joseph of Arimathea. We hear today from John’s gospel and all the gospels, Matthew, Mark and Luke all have accounts of the day that Jesus appears to Mary. But let’s stay with John’s gospel today. In the morning Mary Magdalene had gone to visit the tomb and see where they had laid his body. The Saturday was the Sabbath and no one would have been out and about, especially as the Feast of the Passover had been the main day. We hear that she saw that the stone had been moved and she went to Simon Peter and the other disciple whom Jesus loved and told them. ‘They have taken the Lord out of the tomb and we do not know where they have laid him’. The disciples ran to the tomb and found also that Jesus had gone and only linen wraps left. We hear that the disciples returned to their homes. I wonder what they would have been thinking. Frightened perhaps that they also would be caught, sad that all they had worked for had come to such a drastic end and enormously moved by the crucifixion. Mary stood outside weeping and then saw two angels in white, sitting in the tomb, and said to Mary,’ Woman, why are you weeping? As she told them she turned around and saw Jesus but did not recognise him, thinking him to be the gardener, she asked if he could tell her where he had taken the body of Jesus. But when Jesus said, “Mary!” she turned around and said,”Rabbouni”. What did she feel? What else could she do? There is a lot unsaid in this passage. But what we do know is that she went back to the disciples and told them that Jesus was alive and that she had seen him and the things that he had said. Later on we know that Jesus appeared to the disciples too. The eleven disciples were making their way to the mountain in Galilee, when Jesus appeared to them. We are lucky, lucky indeed. We know the story and maybe even feel a tiny bit of complacency about how we might have reacted if we had been there. I wonder if you really think that. The crowds who shouted for him to be crucified, surely we wouldn’t have done that, we are peace loving people, that wouldn’t happen nowadays would it? Or wouldn’t it. Judas who betrayed him. A disciple so fed up with the apparent lack of progress in the last few weeks, decided that he may as well benefit from the inevitable. I think we would have been much the same, I think we still are. And every time that we turn away from Jesus it is like doing one of these acts. But Jesus gives us forgiveness, he gives us love, he gives us a light to shine in the world. Jesus accepts us as we are with our faults. 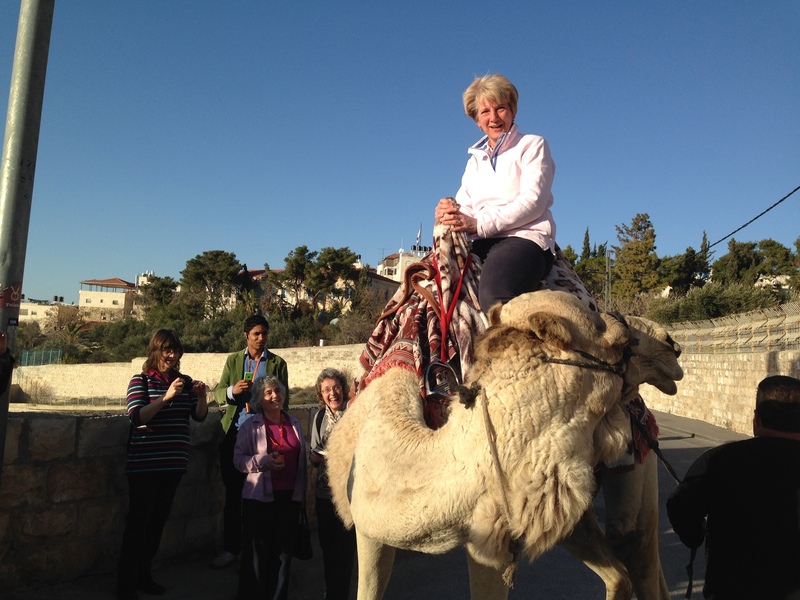 And Jesus went unto the Mount of Olives….. The Mount of Olives sits outside the walls of Jerusalem and from it you can look across and see the city spread before you. We went to the Garden of Gethsemane, which is just below the Mount of Olives, there was some security issues on the day we were intending to visit. It is peaceful, there are Olive trees that have been there for over 1000 years some 2000 years, the gardens and grounds are places to reflect and find some space. When we were there, there were 2 gardeners working under the shade of the trees, gently working I should say, nothing too stressful, a little light hoeing was going on. Jesus had had quite a time of it in the last few days and in the previous chapter we see Jesus being confronted by the Jews, and the people who believed I him, those who were unsure and those who were against him. Passages such as, My time is not yet come, John 7:6 and when his brothers had left him he went secretly to Jerusalem and walked amongst the crowds and listened to their whispers about him.” Much murmurings” and the Jews believed him to be blasphemous. Eventually Jesus is left alone with the woman. This is at the very heart of why Jesus came to save us, to save us from our sins. He finds us where we are, not where we wish to be or even think we should be and hope to be, but where we are. In this place, in this time and just as we are.That doesn’t’ mean we should not try to go on and sin no more, but an acceptance that we as humans are pretty frail, pretty easily led, pretty concerned about things of no real importance. Isn’t that why we struggle, isn’t that why we come back to prayer and to church time and time and time again? In Paul’s letter we find many times his writing indicates that the people he is trying to reach, have not always found the right way. The chapter from Romans is good in that the Romans really did need some extra help in this, their empire was built on worship to other gods, self importance and power and control. But the message is acceptance, acceptance of people and acceptance of you and me. I wonder how your week has been last week…. Mine was pretty busy and both at the hospital and in my other work I have been part of some good and bad times, I have been with people in deep distress, life threatening conditions, looking back at their lives and ahead with their families, hoping and some of them praying that God will be with them. I have been with people who are setting out on some projects that are really exciting, the illustrator Quentin Blake, who is still forging ahead with inspirational work a new book on art and looking through the pictures. I really needed a Mount of Olives time week! Had I done enough? I’m sure I hadn’t! Could I have done more? I’m sure I could but maybe God will give me some time to have another try next week. But like you in whatever it is that you are doing, Jesus accepts us, full stop! It’s up to us to open the door and let Jesus in; that really is all that we have to do. From the Garden of Gethsemane to your own places, Jesus is there waiting to accept us, just go ahead and open the door. Our eyes are opened and at last we see. I have just come back from the Holy Land and have first hand experience of Mount Tabor and seeing and walk in in that place where the Transfiguration happened. What was it that Jesus was asking his disciples here? Why once again, did he just take Simon Peter, James and John? How amazed were they as they stood and watched Jesus transform into dazzling brightness, How unbelievable that as the cloud descended there beside Jesus, stood Elijah and Moses? If we look at what had happened in the gospel so far, Jesus had gathered the disciples, he had explained to them all his ministry, he had started out to do this work. Most recently there was the wedding at Cana and the first miracle, where Mary, mother of Jesus, had asked Jesus to do something to help the wedding family in their distress about not having enough wine. 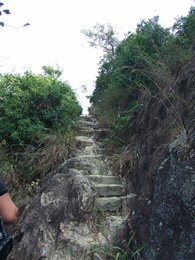 But the walk up the mountain, and this is a mountain that stands clear above the plain of now farmed land, it’s a proper mountain shape and as you ascend to the top, it feels very much like being on the top of the world. And Jesus took the three there to try to open their eyes to what was happening, . Often in Jewish scriptures we hear of the ‘veil of ordinariness that normally prevents us from seeing the inside of a situation. This is a view and an insight into God’s kingdom, Jesus really did appear as the Messiah. The disciples were transfixed. They could see with their eyes wide open, the veil was removed. We often also hear that there are layers and dimensions in this world, usually we like to make sense of all that we see, hear and know and are familiar with. It is hard to take that leap of faith and enter a world of the unknown. It’s a bit like being a child again, like exploring for instance the world of music, or the world of dance, looking through a telescope into the stars. What happens when you take no notice of someone? Do you just walk away and forget all about it, can you cross over on to the other side of the road? I knew a child once who was desperately shy and his Mum told me that to avoid speaking to a friend in the street he fell in a puddle and tried to hide. Bit like the proverbial ostrich with his head in the sand. In Matthew, we have Jesus telling the disciples what to do if people ignore what they are saying. That’s one of the good reasons why we come together to worship as a group in God’s name and to ensure that we do listen. The message that really came to me for this service was Moses and to be honest I made some changes to the lectionary reading, I was sure that you at St John’s wouldn’t mind, a very friendly and flexible congregation, I’m told. The actual reading is further on in Exodus, but it all really starts at Chapter 3 and the meeting with the Burning Bush. If you have chance this week, do carry on reading Exodus, we often leave out the Old Testament these days and Exodus is such a wonderful story and has lots to say to us. Do have a look at see how many of the chapters start with… And the Lord said to Moses. Moses, leader of the Israelites, led the people out of Egypt, across the Red Sea, when the waters divided, so long in the desert, Moses found them water and manna and quails eggs, he brought down from the mountain the Ten Commandments written on stone, he had a staff which God gave to him and changed it from a snake, his staff did all sorts of wonderful things. In fact, he was a modern day Super hero, and I’m going to include, Superman, Batman, Gandalf, Professor Dumbledore, and…. Lets look at some drawings of these super heroes, where did they come from and how did they start. My passion is children’s books and I love the similarities between Gandalf, and Professor Dumbledore, the cloak, the long hair, the staff, the ability to lead and take people with you to strange and uncomfortable lands and places. What happens when super heroes and powerful people are ignored? What about the people in the stories, can they just carry on with their lives just the same or do they need help and do they have to do something to make that help happen? Harry. Bilbo and Frodo? Moses,as a young baby was rescued, all the baby boys were about to be killed( there are some advantaged to being a girl after all!). He was hidden in the bull rushes ad the Pharoah’s wife rescued him and looked after him in secret, with Moses mother acting as the nurse. As and when Moses grew up he saw an Egyptian killing a Hebrew man and others fighting, he intervened and the Pharaoh then sought to kill Moses, so he fled. Eventually he went to Midian and there married Zipporah, daughter of Jethro, priest of Midian. Meanwhile the king of Egypt died and the Israelites were deeply unhappy and called out to God for help. But God was tired of their calling and not listening, that for a while he did nothing. And that’s where the Burning Bush comes in. So we have Moses, a reluctant man, just going about his normal work. ‘There the angel of the Lord appeared to him in a flame of fire, out of the burning bush’. The bush. Moses noticed was burning and not going out. Moses in that few seconds had not ignored God and was going to listen. He turned aside. He looked back and God saw that Moses had turned back and he called to Moses, ‘ Here I am. This is really interesting because God comes directly to Moses and from the conversations he is talking to him like a friend. And from that point Moses is set to do the work of the Lord, although he questions and argues, he is set to do the work of the Lord. When we hear the word of the Lord, there is no turning back, once you have listened and been called, your life is in God’s hands with your own free will but there is no turning away. ‘ If you are ever in the desert and see a bush burning without going out, walk away as your life will never be the same again’!!! The conversation with Moses lasted for a while, Moses was not a super heroe at that point and he actually thought for a while that life as a shepherd for his father in law was a nice easy option. But that was not to be, and God told Moses of all the things that he was to do for Him and his people Israel, he had heard them crying out, he had seen their suffering and he was going to enable Moses to lead them out to a ‘land flowing with milk and honey’ and to tell the Pharaoh that they were leaving. Moses continues to plead that he was not able to do this, God gives him the staff, and after still more anguish from Moses God becomes angry and agrees to also give Moses his brother Aaron to help him. It’s not easy being a super hero, it wasn’t easy being Moses, but he did what God asked and he led the Israelites out of Egypt and he is the father of so much of how our faith comes to us today. We cannot ignore God, he calls us in different ways, he talks to us through actions and times and places. Lets walk together in the paths of the Lord, it will take us to great places and its just what we have to do. 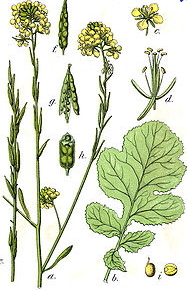 A mustard seed so tiny and innocuous , but it has an intelligence to become a a large plant in a year, to spread and to grow and to produce beautiful flowers. How though can the kingdom of God be like a mustard seed? No wonder that the disciples found it hard to follow, a country, a world, a universe like a mustard seed? The world is a pretty big place. The vastness of the oceans, the great continents and land masses, no-one could say that our world is small. And the universe, well there is something that is so vast it the size is beyond our comprehension. I will never get used to the enormity of the journey,across the world, but once a upon a time it would take weeks, now only 24 hours to get to the other side of the world. If you go star gazing, look up at the sky on any clear night and find the brightest star, then work out how far away that star is, then work out how large the Milky Way, our galaxy is, and then work out how big the universe is. The maths are certainly too big for me and you don’t really need maths to know that the enormity of space and beyond all that we can see and understand is vast. And that is how big God’s universe is…. and yet it is like a mustard seed? The smallest of all seeds and grows to be one of the largest plants. Above our heads is the universe, or at least half of it and each of the stars is just a tiny pin head size. Is that vast or what! And to go to John 14:…. There is a dwelling place for us all. So how big is the kingdom? Well, I don’t know the answer to that! But I think what Jesus was saying was that it is very hard for us to comprehend, as we have no real understanding of how large it can be and yet be a place where God finds us all a space. Nowadays we can make long journeys across the world into relatively short amount of time. But if we can do that how easy is it for God to have created a world and a universe that is vast to us and yet of no size to Him. Jesus uses this story along with the other parables as a way of trying to makes sense to us and to the people he was talking to on the banks of the Sea of Galilee about the kingdom. A place for us all, so vast and yet no size at all or at least not as we know it. We like to measure and understand dimensions like time and distance, but yet maybe if we just sat back and allowed our minds and hearts to know that God has created the universe and the world like a mustard seed we might understand that it is beyond our understanding. And later on in Matthew Jesus talks about the pearl at the bottom of the ocean and the treasures that there are in heaven. There are many stories about pearl divers and the one I know is set in the Arabian Gulf, so full of imagery of bright blue skies and deep azure blue seas. The story is, The Pearl Diver by Julia Johnson. Saeed is going to learn how to dive his father has promised to teach him! It is the start of the pearling season and this is his first trip out on to the waters of the Arabian Gulf. Leaving the rest of his family behind on the shore, Saeed and his father join the crew of a pearling dhow and set out to spend the hot summer months on the high seas. Saeed learns how the pearl divers hunt for the treasures of the seabed, and discovers the secrets and dangers of the sea. This was about a time before the oil industry and is a beautiful story. The pearl is exquisite, it is hard to find and you have to dive deep into the waters and risk a lot to find it. But the treasure is there when you do find it. On returning to the surface, coming up out of the water you can keep the pearl to yourself or you can show it to others for all to see, the beauty, the splendour and the majesty, all there in that shining pearl in your hand. What more convincing does anyone need to think about the treasures that we can all have, the mustard seed and the pearl. Follow me…. Sounds easy doesn’t it! We’re going on a journey then, let’s go for a walk… follow me and lets see which paths we shall take. Have you ever been on a walk and come to a point where two paths start to separate and go in different directions. Which path do you take? One lays in front of you and looks the right way, it may be a clearer path, the grass already trampled down and looks as though it will lead somewhere. The other path is not so well used, it can look a bit less likely to be right, maybe there are some brambles across it and it doesn’t look that clear which way it’s going? But I’m sure you know the theory of the well worn path…. It is worn down more because more people have gone down it and then finding it to be the wrong path have turned around and come back. So in fact the path least travelled can be the right one. Now I hope you won’t go out into the remote country and take this concept too far!! But what else do we use to find our way…maps, compass, the sun in the sky and even the lichen on the north of the trees, that’s for when you’re really lost! Now, Luke is a good story teller and the story about Jesus and the disciples is a good story. Its about changing direction, its about finding the right way and following the right path. Jesus has set his face to Jerusalem, we’re told. 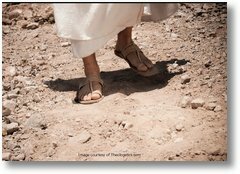 He is determined to make his way to Jerusalem, the disciples are not so sure. People stop him by the roadside and want to follow him. But Jesus tells them that this is hard, The Son of Man has nowhere to rest his head. And then he tells people that they must give up everything to follow him. This is hard and a hard one to come to terms with, so will try and explain how I see it. This is not the easy option…. Follow me… has implications. It’s not all smooth and honey like. 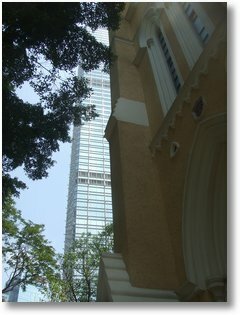 People see Christianity sometimes as the soft option, but soft it is not. Once you have heard the word of God then you have to act. Follow me. Don’t get started and then think it’s too hard and turn back, those who put a hand to the plough need to carry on. Like the path that is most worn, worn by people who have already travelled along that way but have turned back. I find the words in Luke, very hard, who wouldn’t want to say goodbye to his family and to bury his father. But no time for that or maybe it’s Jesus’ way of dealing with those who expressed a desire to follow Him; He seems to be trying to DISCOURAGE them. BUT NOT REALLY. In actual fact Jesus’ desire is that people WILL follow Him – but He wants them to think it through first . . . to count the cost involved . . . so that once they DO follow Him they’ll never turn back. Even as He spells out what is required in such clear, shocking terms, inside He is longing for them to accept it – He’s rooting for them – but the cost is the cost . . . it’s non-negotiable . . . and they MUST be prepared for it. This is also a turning point for the disciples… we’re on the way now, the way is set for Jerusalem, the disciples may want to influence where and how Jesus goes to Jerusalem, but Jesus is determined to go his way an on his own terms. His face is set to Jerusalem. 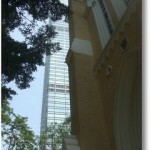 Follow Me…. I wonder how many of you are on Twitter? One of the big things there is who do you follow? Well the real person to follow of course is Jesus. So how can we sit back and do nothing? And Jesus at this point, as he starts his ministry, it’s like a gateway. 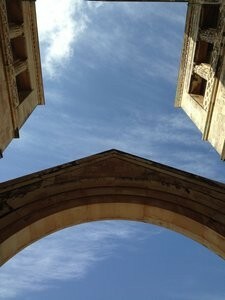 A gateway into his ministry and from here he and the disciples are journeying and spreading the word to all people. This included the Jews, and the Gentiles. This was and is now a message for all peoples. Loose the bonds of injustice and let the oppressed go free. Nelson Mandela made a famous speech based on the same thing when he said that he hoped that never again would one group of people be oppressed by another. But what do we have…. Many places in the world where people still live in oppression, Syria, Central African Republic and others. Before I get too political…. Let’s get back to the light of the world. Would you ever light a light, then put it under a bushel (you know the saying, don’t hide your light under a bushel?) or in modern terms hide the light in the cupboard. What we all have is a gift of light and a gift to show that light to others. To spread the good news. In a few weeks’ time we come into the season of Lent. A time of fasting, only broken on Sundays, which always seems odd to me. But Lent is a time to spend some time, to give yourself a chance to think about what you can do and how you can spend your life. It is indeed a period when we can reflect, sit back in the chair, read a good book, go for a walk or whatever it is that you know helps you to relax. And this is also a time when God can have chance to find you…. We spend a lot of time trying to ask God for things, the request slot. How much space do we give Him not only to answer but to also tell us something. The light of the world came to earth. You are the light of the world, says Jesus. “Then your light shall break forth like the dawn. Says Isaiah. Pilgrimages, like in the Voyage of the Dawn Treader are fraught with mystery, testing and transformation. We can have a pilgrimage of our own faith journeys and not even set foot outside the house. Or we can embark on an adventure with real travel and set out to journey, to find whatever we do along the way. The destination or the end point may be a goal, when we first set out, but over time it can change, we can find that what it was that we were searching for is not the right thing at all. Or even that we have it all the time, right back in our own hearts and homes. In the Voyage of the Dawn Treader, and I recommend that you read it, there are so many messages hidden in the text, it is an allegory of a Christian journey. Eustace, Lucy and Edmund are drawn back into Narnia and meet Reepicheep, a knight and a mouse, Prince Caspian and others from Narnia. They journey East to the edge of the world through all sorts of dangers and strange places. Lucy and Eustace find themselves looking inwards on themselves and trying to come to grips with the essence of their lives, Lucy is approaching growing up, whereas Eustace, who is transformed into a dragon realises that he has been unkind and nasty. In a spirit of redemption and baptismal cleansing, he is brought back to himself by Aslan. Aslan is the only one who can help him to get rid of the old scaly skins, which as they are peeled back enable Eustace to be reborn. Their journey and any pilgrimage is a journey into the unknown, a time of testing, a time to keep on going, and also a time for God’s identity and place to be found within us. 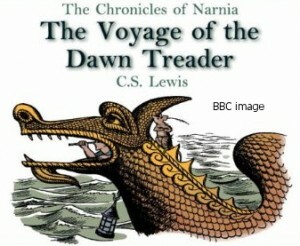 The travellers on the Dawn Treader had set out to find the lost seven Lords of Narnia, to restore some order to Narnia and to discover what is beyond. For ourselves, we have a goal on a journey, a place we want to find, and end to the travelling and a companion to find on the way. But what adventures are to be found before we reach our destination. As we meet in the church, let’s look out of this great East window, clear and large, an opening towards the east and the dawn. Not often here at the dawn on a sunny morning but I bet it would be spectacular, sun streaming in and even getting us warm!! The east, is significant as it is where nearly all our churches face, we turn to say the creed to the east, face the altar on the east, we kneel to say our prayers facing east, and at our end, our bodies are facing east too. The Voyage of the Dawn Treader, or the boat that sailed into the east….. whichever way the pilgrimage that they made enabled all the passengers to face adventures of life that lay ahead of them. So let us too face those adventures, with a strong heart and a pilgrimage journey into the unknown. What does God want us to look like? How does he want us to be? In Jeremiah, the question is being asked again and again. How does it feel when we’re not in control of our own lives? And how do we let God have control of our lives? We cannot give ourselves security, we have to accept that we have weaknesses and live with those. We spend a lot of time trying to be in control of our lives, and when we do this can lead to idols and worshipping things that are just in our control, even our selves. In 2 Timothy, Paul is at the end of his life and is saying that he has had to give up much to follow God and that when he was down no one came to his defence, he was rescued from the lion’s mouth…. God gave him strength so that the message could be proclaimed to the Gentiles. There are moments when we all feel abandoned, things are too hard. Why? We have sinned and the result is a feeling of abandonment. We need to turn around and go in the opposite direction, get back along the path. Admit our weaknesses and ask for forgiveness. Repentance is when you know you’re going the wrong way and you turn back and follow God’s way. Faithfulness is a beautiful virtue and one which enables us to follow God’s call. 2 Timothy…. The Lord stood by me. Dependant – we are dependent on God’s grace. We need to ask for that dependence. Luke 18 The Pharisee who shows that he does everything correctly and is very much in control of his life, he does all the right things. He fasts twice a week, he gives a tentht of his income away…. But he does not give the control to God. Where do we seek control? It is for Him to meet us rather than for us to meet Him…. Findings space, contemplation…. ‘I have a dream…. That one day my children will be judged, not by the colour of their skin but by the content of their character’. 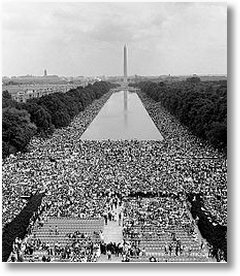 Martin Luther King August 28th , 1963 at the Lincoln Memorial, Washington The March on Washington for Jobs and Freedom was partly intended to demonstrate mass support for the civil rights legislation proposed by President Kennedy in June. King and other leaders therefore agreed to keep their speeches calm, also, to avoid provoking the civil disobediencewhich had become the hallmark of the civil rights movement. King originally designed his speech as a homage to Abraham Lincoln‘s Gettysburg Address, timed to correspond with the 100-year centennial of the Emancipation Proclamation. And by goodness he did!! What a dream and where are we now with this…. Well we have a much better system and black people are generally treated with much more respect than in the 60’s. It amazes me that in the 60’s I was unaware that there was anything wrong! Growing up in a white based country and county, I had no friends who were black or in my case from outside my local sphere in Norfolk. In the UK of course we had invited in to our country people from the Caribbean to work here and to help us to get things going at the end of the war. But it was indeed a very different place than now. America has of course a black president and that was such a powerful symbol when Barack Obama was elected, does it surprise you that it took over 50 years to get to that point? It really has moved on a long way and that is good. But what a long way we have to go. Martin Luther King’s dream address could still be used today, if we were black and living in the UK life is very different to the life we see. One of the interesting comments I heard this week about the speech was that it was a dream, a vision, a hope, a wish…… Not a complaint, not a statement with issues, not an indictment to riot…. It was a dream, a hope that one day, one day, we would all be judged on the content of our character. That is as true today as then, we make some pretty instant decisions about people on the basis of what they look like and there is some complicated psychology at work in our first meeting and that split second recognition of familiarity etc. In Luke, verse 1, we have that they were watching him closely, what were they making of this person, who had been teaching and preaching, did he fit their understanding of what he looked like, after all he came from Galilee and there was a clear stereotype of the fishermen from Galilee. How many people see the same thing in those who come from Norfolk!! The passage is about the placing of people of honour and how we should give time to others as well, in fact we should out them higher than than those in higher circles. So Jesus, was saying that we should recognise more than just the outward appearance. As we know he very much supported those who were good people and at the edges of society and saw their struggle. And today, where is the struggle? Where is the dream? There are a number of facts that would show that if you are black you are more likely for instance to be stopped and searched by the police. A poet Benjamin Zephaniah, who is black Caribbean , told of a time he was stopped frequently in Birmingham. He has now gone to live in Sleaford? But for me the message from Martin Luther King must be that dream, I have a dream that one day…… a hope a vision, that is and must be what keeps us going a hope that one day this dream will be true. 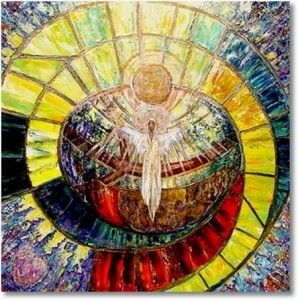 Trinity Sunday and the season of Trinity continues now until Advent! But before we think about this, I wanted to mention the dreadful event this week in Woolwich, when a young man on off duty soldier was killed in broad daylight. This was horrendous and I can only describe it as an act of sheer evil and let’s keep in our prayers the family of Lee …. But let us not allow further evil to take root from this act, I do believe that the devil is waiting for opportunities to spread terror, fear and mayhem in this world. Like many I have been unable to look at the pictures that the papers held of his killer, Michael. I refused to give him and his act to have any space in my day. It has been denounced by the Muslim faith as abhorrent, this is not done in their name. Do not be overcome by evil, but overcome evil with good. Romans 12:21 But what there was in that scene, was reminiscent of the Good Samaritan. There were 3 women, who were with Lee as he laid on the ground, being with him as his life slipped away. What courage! Another woman tried to talk to the killer! What courage! These were people who had not expected anything like this to be happening to them. Overcoming evil with good. I would like to think that we can let them have the last word. A small silence. But Trinity Sunday For many this conundrum of the doctrine of the Trinity; Father, Son, and Holy Spirit has been the source of much confusion, misuse, and controversy through the ages. Are we really worshipping three gods? And we have indeed fallen back into creating a pantheon of gods like the Romans, the Hindus, and other religions. I like to think about the Trinity as in 2 Corinthians, the grace of our Lord Jesus Christ, the love of God, and the fellowship of the Holy Spirit. Three in one, and one in three. Not part of, or in any dimensional way that we can conceive, but a God who finds ways to ensure we can find him and work with him to make this world his own, and a better place for all people. In the Old Testament we find that God has worked with the prophets and Moses to ensure that his people are kept safe. But still it is not enough. Laws that are written were not truly held in the hearts of the people and they could not see beyond the rule itself. Jesus, God’s only Son is sent from heaven to be with us, for always. And as he returns to heaven he does not leave us alone but sends to us the Holy Spirit, the enabler and mission giver, showing us our paths and helping us to follow them. The three in one. 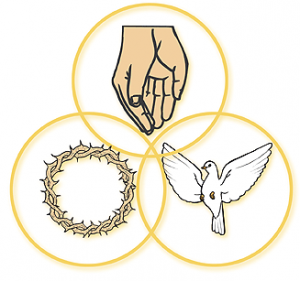 Enabling us to find our way to God and for God to reach out to us, Part of the Trinitarian approach involves the dichotomy of Jesus as both divine and human. Jesus starts his mission with the proclamations of the coming of the Kingdom of God among us, his authority in speaking of God. Not an easy one for the Jews and the Romans to follow. At Pentecost Jesus sent the Holy Spirit to work with the disciples and show to them and to us just what we can do. Slowly the reality of what Jesus had said to the disciples and to us about the relationship with the Father began to dawn upon us. At Pentecost, that power came like flames dancing on heads and enabling, empowering and showing us what we should be doing, our life’s pathways and journeys. Three in One and One in Three Beware Christians who think they have God all figured out, they don’t.! We do know quite a lot, there is much that we cannot understand and we just need faith that God is with us on our journey. God is One, perfect in unity, complete in wisdom and grace and God is also Three; Father, Son and Holy Spirit; God Creates and continues to create order out of Chaos; that God suffers, and that God shares God’s loving power with us; but more that this that somehow in relationship with Godself; Three in One; and through Jesus Christ meets us where we are. Through the Spirit we are continually refreshed and when we follow where it is asking us to go we find the true peace that the one God, the three in one can give. And, we also know from our experience of this mysterious Triune God, that sometimes the divine mission blows us into directions that confuse us, challenge us, and sometimes terrify us. 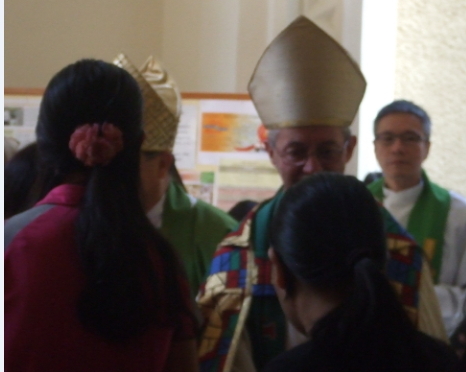 But always, for true expressions of Trinitarian faith is God’s deep and steadfast love for all of us, and the world.